Words, photos, and code by Dan Nguyen. The 'g' is mostly silent. 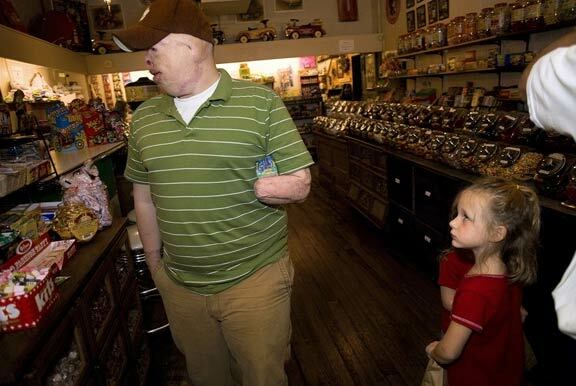 Jan. 2, 2012: Tyler Ziegel passed away on Dec. 26, 2012. He was 30. The Peoria Journal Star has a story about his funeral. RIP Tyler. Stopped at the Whitney Biennial last night at around 2am (it’s been open on a 24 hour schedule this week). The modern art at the Whitney may be too modern for me and my MoMA-loving-style, but there were a couple rooms of powerful documentary photography, including Nina Berman’s 2006 World Press Photo Portraiture winner, of Marine Sgt. Ty Ziegel. Even if the Whitney isn’t your kind of art, the Berman exhibit is worth a visit this Memorial Day weekend. Ziegel suffered burns over his entire body after a suicide bomb attack in Iraq. Berman’s award winning photo was of Ziegel, then 24, and his 21-year-old bride, Renee, getting their wedding portrait taken at the studio. I don’t know what the official portrait ended up being, but Berman’s take, with the bride’s haunted expression, turns the cliched-wedding-portrait on its head. Read a Salon Q&A here. I remember seeing that photo in the awards gallery, but the Whitney exhibit featured more than a dozen photos of Ziegel’s life, then during the wedding, and then a follow-up in 2008. 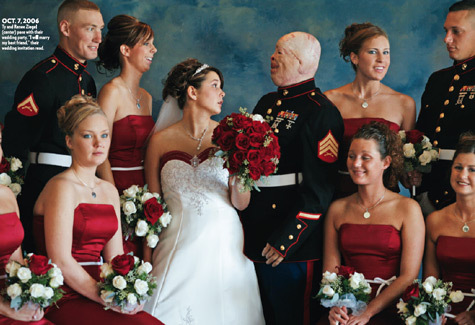 Their marriage on Oct. 7, 2006 was hailed as an example of the power of love: two high school sweethearts making the commitment despite Ziegel’s disfigurement. 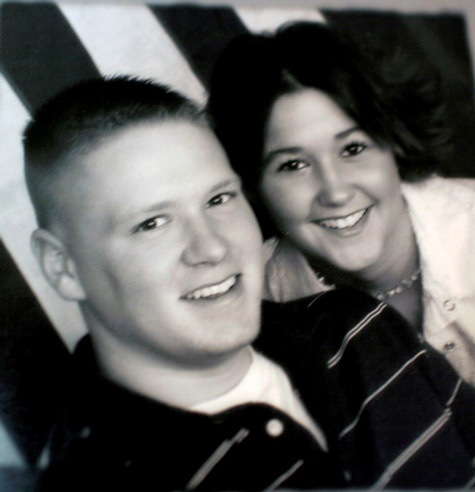 That day was declared a state holiday: “Renee and Tyler Ziegel Day”. I asked Ty, what do little kids say? Do little kids get scared? 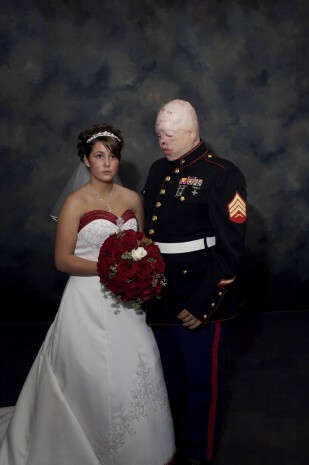 In my book, I’d photographed a really severely burned soldier. And when I was with him I’d see kids shy away and he would smile at them. Ty would just laugh — he’s got a great sense of humor. Kids would say, “What happened to your ears?” and he’d say, “The bad guys took ’em.” They’d say, “What happened to your nose?” and he’d say, “The bad guys took it.” I guess he tried to make some little game out of it to deal with it. Most of the time, [Buddy Robison, Tyler’s best friend] and Ty talk about music. And, like Becky, he isn’t worried about Ty moving on and falling in love again. “Someone will see through his skin and see his heart,” he says. And what of his own personal feelings about Renee? Buddy smiles. “That’s a hard question.” He takes his time before answering, choosing his words with care. There has only been one incident where there’s been trouble. A little over a year ago they were leaving a bar and a bunch of local college kids made fun of Ty. There was a fight. This entry was posted in thoughts and tagged iraq, memorial day, Nina Berman, photography, Tyler Ziegel, veterans, war, Whitney Museum on May 28, 2010 by Dan Nguyen. Kurt Vonnegut's brilliant, brief career at Sports Illustrated: "He was not good at being an employee"
My name is Dan Nguyen and I am the Head of Data at Skift.com. I do a lot of programming and photography. Dan Nguyen is a developer, data analyst, journalist, and photographer. You can contact him at dan@danwin.com I'm trying to do more of my blogging at blog.danwin.com.